Hello! My name is Nicole and I am a part of an association at the University of Regina called H.O.P.E. On behalf of the association, I would like to tell you about an initiative we are very proud of. H.O.P.E. stands for Health, Outdoor, Physical Education. We are a kinship of pre-service teachers within the Faculty of Education who look to support one another through an intergenerational mentorship model. As well, we support professional development by promoting healthy active lifestyles within the community. We provide school-aged students holistic health, outdoor, physical education experiences to foster lifelong participation in physical activity and movement. We hold active/social fundraising events to provide resources to schools and community initiatives focused on enhancing the health and well-being of children and youth. 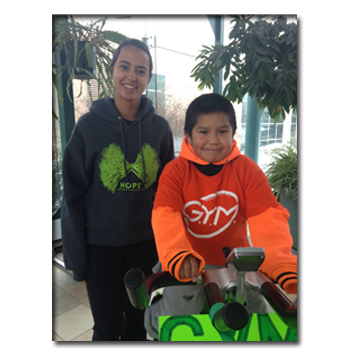 This year we held a bike race to raise money for the Growing Young Movers Urban Aboriginal After School Program. With this bike race, we gathered together to ride stationary bikes, raise awareness and funds for a worthwhile cause. We had the pleasure of having some of the youth and high school mentors from the Growing Young Movers program come to the University and ride with us. This year’s bike race was a huge success. In total, we raised $1780! These funds have gone towards the purchase of running shoes and other equipment needed for the Growing Young Movers program.